These harmless arachnids, Mastigoproctus giganteus, get their name from the long, whip-like sensory organ that extends from the tip of their abdomen. 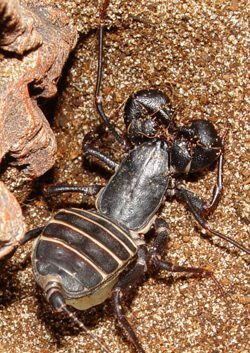 They are also known as Vinegaroons because of their ability to defend themselves by spraying acetic acid (vinegar) from a pair of glands at the end of their abdomen. They do not have venom and catch their prey using only their pedipalps, or claws. Notice the elongated first pair of legs. These nocturnal creatures are basically blind, so they use these legs to feel their way around and search for food. Like true scorpions, these vinegaroons have elaborate courtship rituals and engage in graceful dances before mating. This species is common in desert areas of the southwestern United States.